Band of Brothers Part II: Bomb Groups of the U.S. Eighth Air Force 1942-45 "We Few, We Happy Few, We Band of Brothers"
In the early days of the USAAF daylight bombing campaign, before the arrival of long-range fighter escorts, rarely was a mission flown without Luftwaffe interception and the ever-present barrage of anti-aircraft fire. The Eighth Air Force crews literally fought their way through swarms of enemy fighters and thick flak to hit their targets, then fought their way home again. Seldom a formation returned without losses and casualties, but inexorably the American bomb groups struck deeper and deeper into enemy territory. Bomber crews lucky enough to survive a complete tour were few and far between. They knew this when they arrived in England at the start of their tour, and the awesome task they faced banded the flyers together like brothers. They flew and fought for each other, their country and liberty with determination and a camaraderie that only those who went through the experience could fully appreciate. In his tribute to the USAAF bomber crews, Robert Taylor has selected the 381st Bomb Group to represent, and pay tribute to all those who flew the perilous daylight raids out of bases in England into the heavily defended skies above enemy occupied Europe. 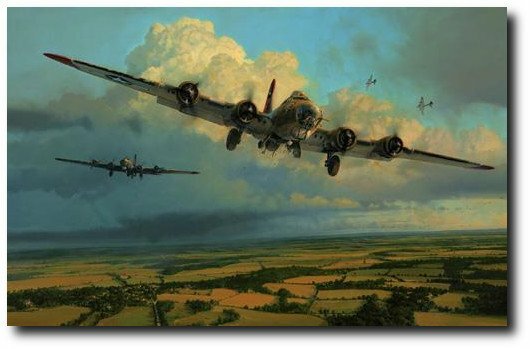 Robert's emotive painting shows 381st Bomb Group B-17 Fortresses returning to Ridgewell on a summer afternoon in 1944 during a period when the Group reached the peak of it effectiveness- for several months it was the top ranked outfit in the Eighth. Between June 1943 and the end of hostilities the 381st completed 297 combat missions, hit almost every important target in German hands and was credited with the destruction of 223 enemy aircraft. One aircraft, more than any other, came to symbolise the great bombing campaign of the USAAF in Europe during World War Two, and in his spectacular new painting Robert Taylor captures the magnificence of Boeing's legendary B-17 Flying Fortress. In his inimitable style the artist brings to life an exact wartime scene, a battle-damaged aircraft making apparent the fearsome task tackled daily by those who flew the hazardous missions to occupied Europe during the greatest air war ever fought. The second in a new collector Portfolio of Limited Editions by Robert Taylor commemorating the great Air Commands of the Second World War- published in part to support the American Air Museum, Duxford, England.